So sayeth Marvel's president Kevin Feige... and it's pretty hard to disagree with his logic. 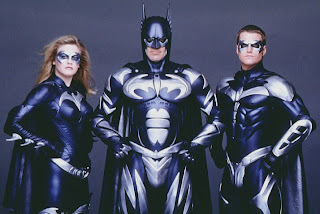 1997's fourth and final installment of the original Batman film franchise, notes Feige, "was so bad that it demanded a new way of doing things. It created the opportunity to do X-Men and Spider-Man, adaptations that respected the source material and adaptations that were not campy." Batman & Robin was such an atrocious waste of celluloid that it's now deemed the benchmark at which comic book film-making hit rock bottom and began the climb toward sincere and serious adaptations like The Dark Knight... because at that point things certainly couldn't have gotten any worse! If I understand correctly, George Clooney is apologetic about the movie too. I think he deserves none of the blame for the movie. In fact, I usually forget that he was in it. I put all the blame in Joel Schumacher. But, even Joel Schumacher isn't all bad. At least he did well with A Time to Kill and Phone Booth. Michael Bay is definitely worse.